Lord of the Blade will always be special to me, as it was my first ‘baby’ so to speak. I wrote it years ago, being the first medieval romance – actually, the first romance – I ever wrote. I have always loved anything medieval, with my all-time favorite movie being Lady Hawk. That movie had all the elements I crave – medieval, paranormal (shapeshifting) and of course romance. Corbett’s mother has died birthing his twin brother and sister. He believes them to have been stolen by the nursemaid and died at sea. That is only partially correct, as we see in the third book of the series, Lord of Illusion. Madoc ap Powell is Corbett’s long lost brother but neither of them know it. He has been raised as a thief by the disowned wife of a pirate. The heroine, Abigail of Blackmore, is a lady on the run from marrying the evil lord of Shrewsbury. She takes up with the thief, not knowing he plans on bringing her right to the place she is running from – Shrewsbury. In the fourth book of the series, Lady of the Mist, we see Madoc’s twin sister, Echo. She has been raised by an infamous pirate as the son he never had. The hero, Garrett, is the brother of Abigail and also a baron of the Cinque Ports. He has sworn allegiance to keep the channel safe, and when he encounters Echo’s pirate ship, both their lives take a drastic turn. Four siblings all with fascinating tales of their own are brought back together in the Legacy of the Blade Series. Each book can stand alone, but characters from the other books are brought in at the beginning and the end. This enables you to see what has happened in their lives, but it may ruin a surprise or two, so I suggest to read them in order if you can. Please visit my website at elizabethrosenovels.com to read excerpts from each of the books. And thank you once again for your wonderful reviews and support! Watch my website, as the second book in my Elemental Series, The Duke and the Dryad will be released sometime in June, 2013. This is also a medieval, with paranormal elements included. 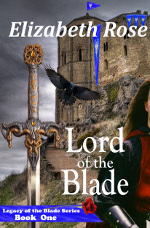 You can read more about Lord of the Blade right here on Medieval Romances. This entry was posted in Blogs, Medieval Romance Monday and tagged elizabeth rose, medieval romance monday. Bookmark the permalink.